I cannot tell you how excited we are for Summer! We're looking forward to slowing down and spending some much needed time having fun with family and friends. Summer is the perfect time to make special memories with your family. How about winning some PayPal Cash to help you to do just that? I have teamed up with an amazing group of bloggers to bring you the ultimate cash giveaway worth $425USD PayPal Cash! We wanted to celebrate all things summer and make it easier for you to get out and do the things you want to do to make great memories with your family! 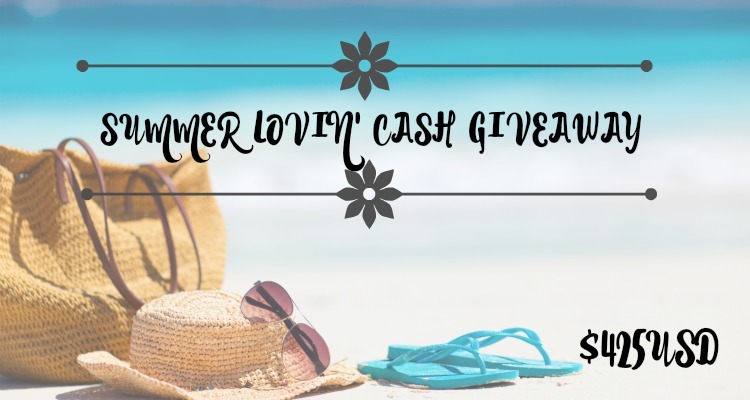 Take advantage of this wonderful giveaway and enter now for your chance at the Summer Lovin’ pot. We are going on vacation in July, and I would put it towards food and expenses for that. I would use the money to put towards some local day trips this summer. I would use it to buy some fun things for my daughters like a scooter or new bikes. I'd use it toward paying bills and the rest on savings, and groceries. I will donate 10% of the money to a worthy cause and the rest will be saved for a future event! I'd go on a road trip to visit family if I had the money! It would be nice to see some people that I haven't seen in many years! I'm taking my grandson and his friend on a road trip this summer. I'd use it to help with that expense. I would buy groceries and gifts online with it. I would use this to buy a sound bar/sound system for our new TV. The money would go towards my summer cruise vacation! We are in the process of fixing our house to sell. I would save it for the new house. We need new furniture and moving can cost so much money! Omg!! I would get all my girls stuff for her 1st year of school and take my husband out for an awesome fathers day meal. I would use some for news clothes and save some. The prize would help to take a family weekend getaway! I would put it aside to go towards a family vacation this summer! As we are moving, I would use the Paypal cash to help with moving expense. There's not one big thing that I need so if I won, I'd most likely buy a few smaller things like books and coffee, and running shoes! I would save it for the holidays. With four kids every penny counts! Put in it in savings for an apartment! I would use it for a new laptop. I could really use one soon. My dad recently had double by pass heart surgery. Since he is recovering at home I would use the money to pamper him. A special meal, his favorite movies,etc. I would use it towards some summer family fun. I really want one of those swan floats. I would use the money to fund my baking addiction! I would use this to put towards my vacation in August. i would pay off some bills. especially since we went on vacation a couple weeks ago. I'd pay bills and if anything is left over get a massage. I would buy clothes and beauty products! If I won I would put this money towards my next vacation. If I won this money, I'd put it towards bills. My treadmill died for the second time but this time I could not revive it. I would use the money to buy a new one. I would use it to buy my husband an awesome anniversary gift and my toddler some new clothes! I'm trying desperately to save for our trip to Toronto in August and this would help so much! Money is tight right now, won't bore you with the wah wah details, so this money would go towards our bills. I would use it for my trip to NYC to see Dear Evan Hansen on Broadway. If I won I would use the money towards bills. I could buy my pup his medicine, thank you so much!! Use it to take care of some online purchases! Family road trip to the beach!! I would save it for expenses in life. I would do some back to school shopping for my girls! Take my parents out for a special dinner. I would then use some of it for concerts and some for bills. I would use the money to buy some new toys for my son. He is out-growing most of his! I would also use some of the money on summer fun with him like going swimming or to the butterfly exhibit. I would use it to travel. I would buy some curriculum I need. I'd use it for a bill (one half) and some clothes and maybe toys for my two boys (other half). My step daughters will be joining us for the entire summer and I would love to be able to plan fun activities to our local museum or water park with them and my son. This money would be extremely helpful! Thank you for the opportunity! I would rent a cottage in Canada for the weekend at the beach! I would use it towards a weekend getaway for my husband. It would go towards a new sewing machine. Pay for the rental car for our vacation in August. I would get some organization items for my craft room I really want a tall drawer system and some new clothes! I would spend it on some summer fun with my kids. I would go on a little trip! I would use it to surprise my family with our annual 4th of July road trip. We stay at the YMCA, go to the rodeo and watch fireworks. We didn't plan to go this year because money is tight. Thanks for the giveaway! If I was lucky enough to win, I would take a mini vacation with my daughter.